This month we have some new sponsors who would love to share their blogs, Etsy shops, and websites with you! Our blog receives over 450,00 page views per month and would love to have you listed as one of our sponsors for JULY. Just contact us for a rate sheet. Why Meatbagz? Why not? Life's too short to be boring, so why would you carry a boring bag? 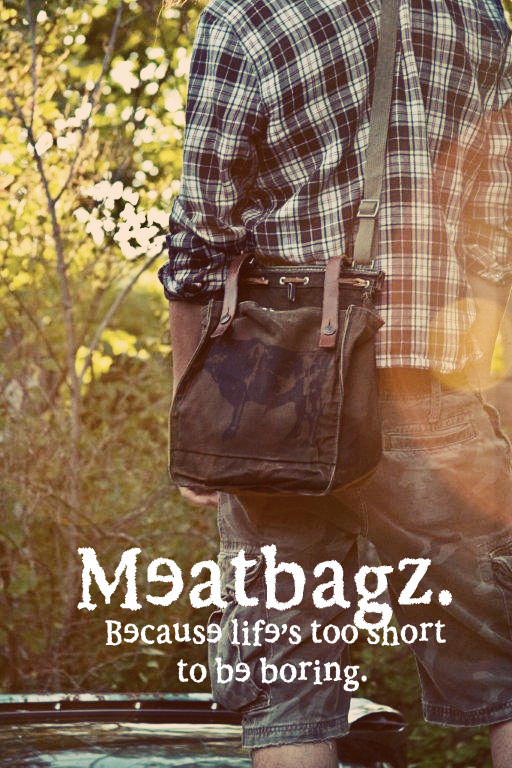 Meatbagz are vintage military and military inspired bags that have been hand printed by the Meatbagz Broads, Mack and Kate. 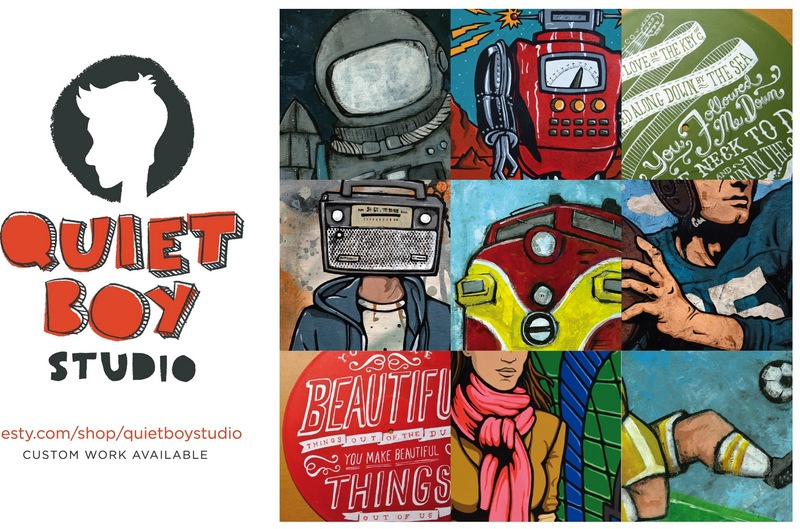 You won't find their original designs anywhere else, darn it, and each print is unique and each print is awesome, just like you. (That's the word on the street, so don't try and deny it!). To sweeten the deal (and because we love Today's Letters as much as you do), just use the promo code LETTERS at check out and receive 15% off your order! 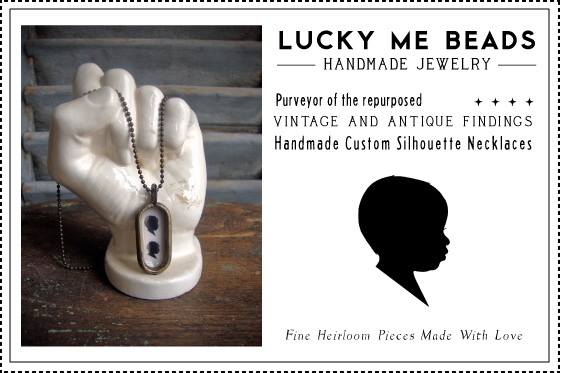 Lucky Me Beads is owned and operated by me, a thirty one (eek!) year old girl living in the foothills of Colorado. My favorite thing right now is working in my garden. I have four black dogs, Lucky, Bob, Charlie and Mick. 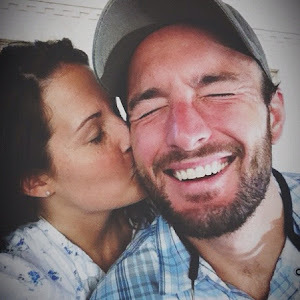 I married my high school sweetheart and we have two amazing sons, with one more baby on the way! I specialize in custom silhouette jewelry using vintage and antique settings. For the month of June, I'd like to offer all of the lovely readers here at Today's Letters 15% off on any order! Just use coupon code "SUNNYJUNE" at checkout to receive your discount. Hope to see you soon! I'm a dad, a husband and an artist. I'm shy but can come out of my shell when finally comfortable in my surroundings. Because I'm shy I take in a lot around me and observe the world as it goes by. I believe life should be simple and joy should be found in the everyday moments that surround us. I want to capture those moments and random thoughts that we all have. Visit my Etsy shop and check out my hand painted song lyrics on old vinyls. 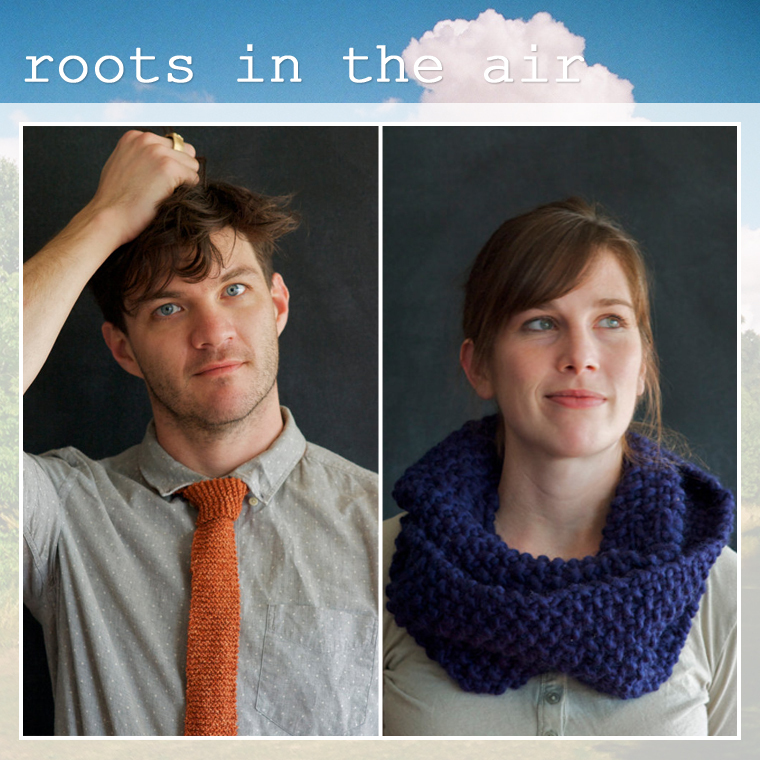 Roots In The Air offers fine hand knit items with a focus on natural fibers. Color and comfort is the philosophy. We make beautiful, thoughtful, and timeless pieces, helping you express yourself. 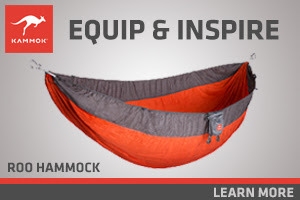 Be sure and check out our shop and blog! Hi There, I'm Tammy and that's my love in the picture with me. Just in case you couldn't tell by the DSLR, point and shoot camera, and uhm, purse my man is holding.. I'm a blogger, and clearly my man is very good to me. Lemons, Avocados & the Bay is all about our beachy kind of lives in San Diego and the little things that make us smile. You can read more about us here and check out our crazy home renovations here. Hope you stop by and say hello. 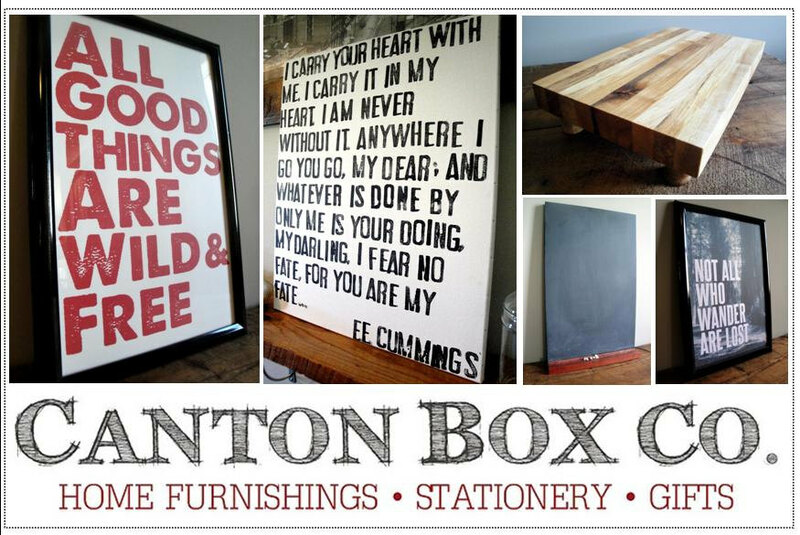 We are Angie & Tyson of the Canton Box Company. Our lovely little Etsy shop specializes in home furnishings, prints, stationary and gifts. We love the Earth, so we never cut any trees down to make our goods ... we only use fallen timber or reclaimed building timbers that we harvest ourselves. Make sure to check out our shop and enter "Letters" at checkout to receive 10% off your entire order. Hi! I'm Alysa - wife, mom, dietitian, personal trainer, crafter, cook, and proud wearer of onion goggles. 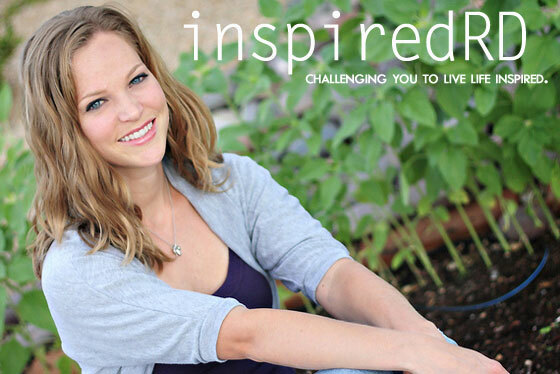 On my blog InspiredRD I share things that inspire me in the hopes that they will inspire you too. Stop by to check out healthy recipes, fitness challenges, crafting ideas and family fun. This year we are focusing on gratitude with the 365 Thanks Project, and would love to invite you to be a part of it. You can also swing by my Etsy Shop to find one-of-a-kind creations using vintage and upcycled threads. look at you tammy-woot woot!